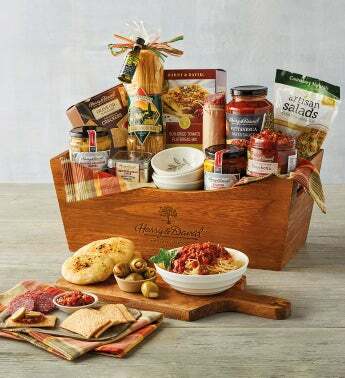 The ideal hostess or housewarming gift, this reusable wooden basket arrives with everything needed to create a wonderful gourmet Italian meal. We've included extra virgin olive oil, puttanesca pasta sauce, a Mediterranean bread dipper, sun-dried tomato flat bread mix, garlic angel hair pasta, along with ceramic dipping bowls. You'll also find appetizers like our fire-roasted bruschetta, Milano Italia dry salami, roasted vegetables, artichoke hearts, four cheese risotto, and more. Arrives with a plaid kitchen towel to use long after the feast has become a memory.